One chicken yard down, another chicken yard and a new garden space still to go. 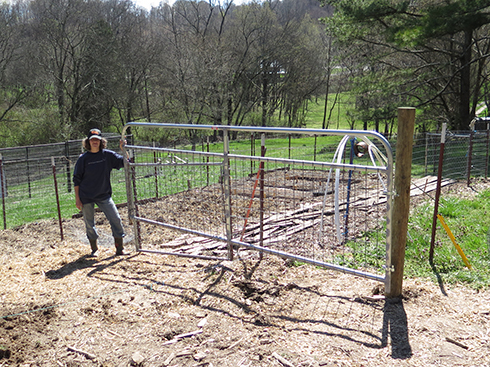 Last week, Chareva attached heavy-gauge chicken wire to the bottom of the first chicken yard and bent it out into the grass. That should be enough to keep critters from digging under. 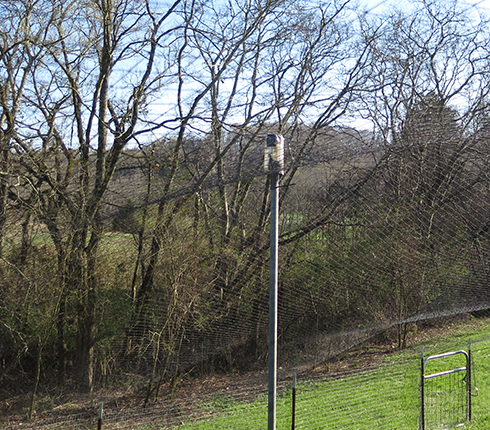 We both attached the net overhead to keep critters from swooping in or climbing over the fence for a chicken dinner. The poles that keep the net above our heads are sunk into concrete poured into a bucket. I dug holes deep enough to bury the buckets so the poles don’t fall over. To keep the metal poles from tearing the net, I covered each pole with a plastic water bottle. It may not be a pretty solution, but it works. Al Gore would be proud of the way we reduce, reuse and recycle around here. 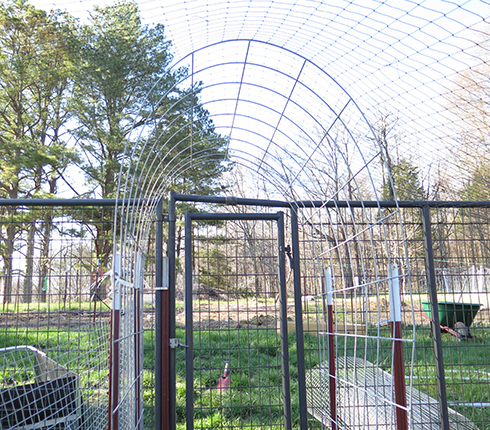 We also needed the net to be elevated enough to open the door into the chicken yard. Not surprisingly, Chareva suggested we construct a canopy by bending a cattle panel inside some t-posts. I say “not surprisingly” because she’s developed a thing for cattle panels. Any problem I raise, any project I suggest, she immediately describes how a cattle panel or two will do the trick. I’m afraid I’ll come home from work someday and find she’s used cattle panels and t-posts to convert our bed into a four-poster model with a nice canopy overhead. 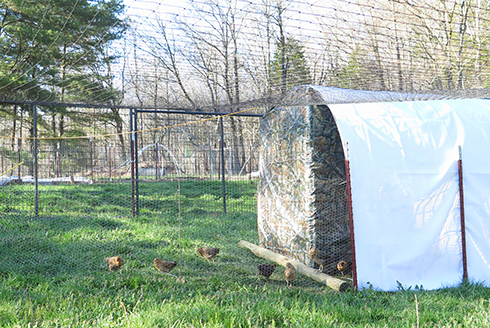 Anyway, after the chicks spent several hours huddled together in their new house, probably wondering where the heck we’d move them next, a few of them came out to explore. 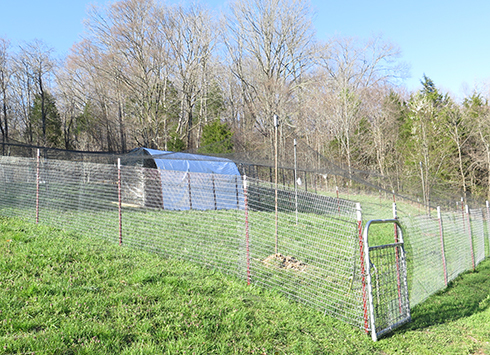 The new chicken yard is one-quarter of Chareva’s spring-project design, which includes two chicken yards and two gardens partly surrounded by chicken moats. I spent much of Saturday pounding in more t-posts to finish off the exterior skeleton of the rectangle that encloses everything. Earlier in the project, I pounded in t-posts along the wrong line and had to pull them up and start over. I was determined not to repeat that mistake, so this weekend I checked and double-checked the line before pounding … and then pounded in a whole line of posts with the nubs facing the wrong direction. Apparently, I really do want the extra triceps workouts. Part of the grand design is to have a wide gate leading to a walkway down the middle of the gardens. 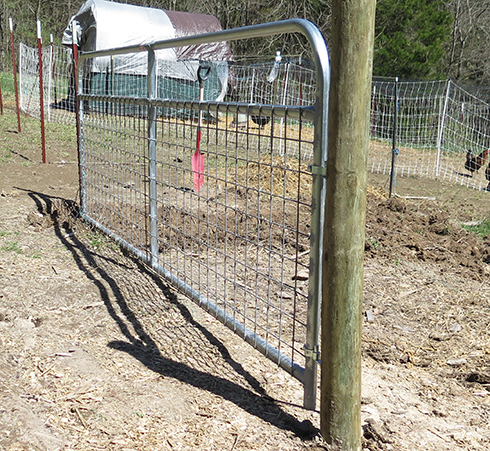 The wide gate is heavy, so we sunk a tall wooden pole a bit more than three feet into the ground, then attached the gate. Looking at the picture below, you’d probably think we lack the skills to sink a pole on a true vertical line so the gate holds a horizontal line. The problem, as usual, is the hilly terrain. (Not that I’m complaining. I love these hills.) Given the slope of the land, we had a choice: elevate one side of the gate stupidly high to provide clearance for the other side, or dig away part of the hill. We chose to dig. 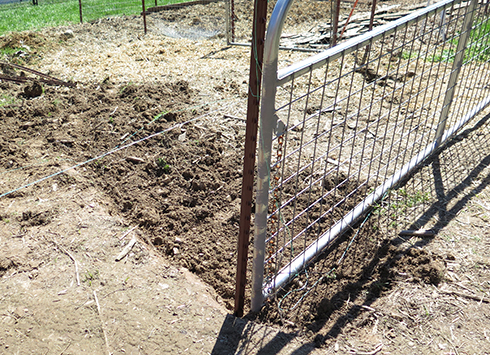 We still have more digging to do so the gate can swing open freely. In the picture below, you can see how high the end of the gate is when it’s all the way open. Like I’ve said before, you pretty much have to stand on these hills to appreciate the slope. Pictures tend to flatten it. 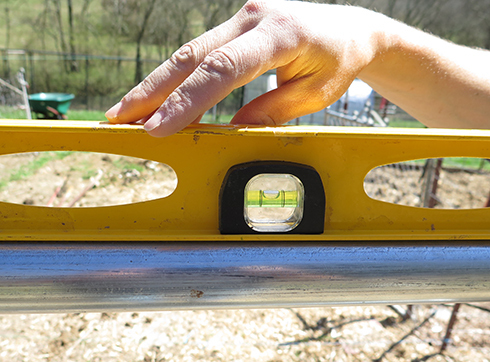 It was a perfect weekend for working outdoors, sunny and in the 40s. Unfortunately, the cool temperatures made me forget I have Irish skin. Since dumping the crappy vegetable oils from my diet, I don’t burn as easily as I once did. But two long days in the sun will still do the trick. So I’m now sporting my first farmer tan of the year … well, farmer burn. And although I didn’t pay attention to the compass while working, I apparently spent most of Sunday with my left side facing the sun. So until the burn fades, I’m officially a Southern redneck, but only on the left. My right side, of course, is still a libertarian. LOL – On the left you’re a redneck – good thing about the right side. The farm is looking great! 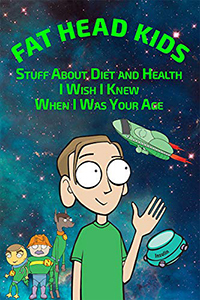 I believe that was a common use for coconut oil before The Guy From CSPI convinced everyone the stuff is poison. Looks very professional. Great job. Lol, truckers tan! What’s your basis for not burning so easily due to cutting out veg oils? (not trolling, legitimately curious). 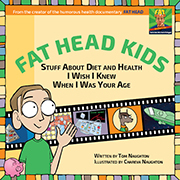 Pure speculation, of course, but the fats we consume end up in our skin, which is comprised largely of fat. Quality fats may mean quality skin that is more resistant to burning. I also suspect that all the hubub about higher rates of skin cancer, everyone needing to slather on sun screen to prevent cancer, is partly because of the switch from natural fats to industrial seed oils. So I’m allowed to moo in bed?